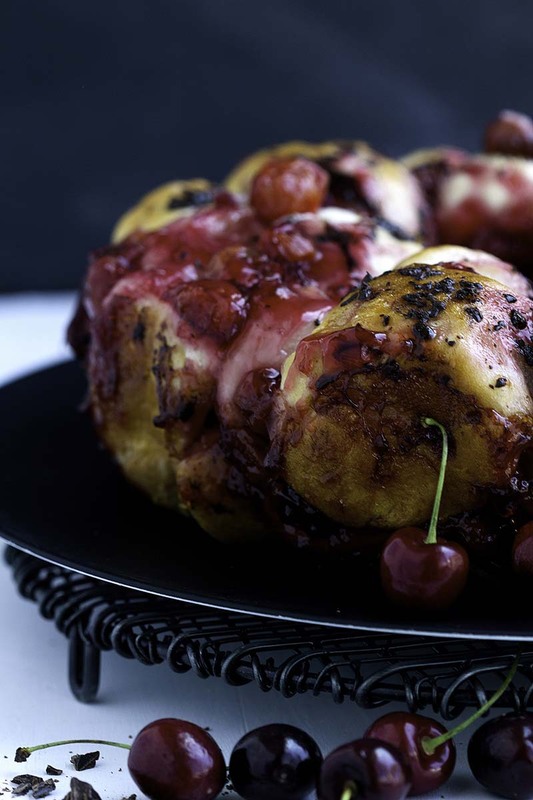 Cherries and chocolate combine for a delicious pull apart bread made with sweet cherry pie filling and dotted with dark chocolate chunks for a recipe the whole crowd can enjoy. Combine milk, water and 1 teaspoon sugar in a small bowl or 2 cup measuring cup. Sprinkle with yeast. Stir until fully dissolved. Let sit for about 10 minutes until it begins to foam. Using a stand mixer fitted with flat paddle attachment, pour water / yeast mixture into mixing bowl. Add egg, butter and ¼ cup sugar. Mix on medium speed just until combined, about 1 minute. Add 3 cups all-purpose flour. Mix until fully combined. Scrape down sides of bowl. Switch to dough hook. Knead on medium speed for 3-5 minutes. Add in additional flour, 1 tablespoon at a time, if necessary until dough comes together. Dough should stick to bottom of bowl but mostly clear the sides. Dough will be slightly sticky and soft. Using a spatula scrape dough into a greased bowl. Turn once to coat. Cover with plastic wrap and let rise 1 hour or until doubled. Meanwhile grease a bundt pan with baking spray. Preheat oven to 350°F. Press dough down gently. On a floured surface roll dough into a 20 x 12- inch rectangle. Cut dough in half. Cut each half into approximately 18 equal pieces. You will have a total of 36 pieces. Roll each piece into a ball using the palms of your hand. Layer half of the dough balls evenly in the bottom of the pan. Top with half of cherry pie filling. Sprinkle with half of chocolate chunks. Repeat by layering half of dough balls, remaining cherry pie filling and finish with chocolate chunks. Bake 30 - 35 minutes or until puffed and golden brown. Cool 10 minutes. Invert pan onto a large plate. Add another large plate on top. Invert back to have cherry and chocolate facing up. Allow to cool for another 15 minutes before serving or eat warm. Recipe created by Gather for Bread. can this be made in bread machine? You could make the dough in a bread machine, following the manufacturer’s recommendation for the order of adding ingredients to the pan. Use the dough cycle, and remove once cycle is complete. Then continue with recipe — placing dough in greased bowl, cover and let rise. I would recommend reducing the liquid temperature to around 80 degrees F. Cut the softened butter into smaller pieces and warm with the milk and water to 80 degrees F. Butter will not melt.